Most foreigners are required to register free their stay in Kazakhstan with local authorities (Police). 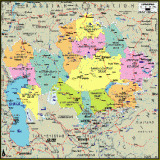 If you are arriving in Kazakhstan through the country's 12 international airports, the railroad crossing at Dostyk (Druzhba), land crossings at Khorgos, Dostyk, Bakhty, Maikapchagai, Kordai and Kolzhat, and at the seaports of Aktau and Bautino you should automatically be registered in Kazakhstan. As proof of registration, you receive a migration card with two oval entry and registration stamps from the Border Service of Committee of National Security of the Republic of Kazakhstan. The automatic registration is valid for the term of your stay and up to 3 months depending on the type of your visa. For stays longer than 90 days, you should register with the Migration Police, (formerly known as the Office of Visas and Registration, or OVIR) in the jurisdiction where you reside in Kazakhstan. If for any reason you did not receive a registration card immediately upon arrival in Kazakhstan, you should register with the Migration Police in the city where you are staying within 5 calendar days. If you who do not register you may have to pay fines upon departure and your departure may be delayed. Visitors registering a long-term (more than 3 month) stay, must present a certificate indicating a negative HIV test conducted no more than 1 month before registration. Evidence of an HIV test performed abroad is acceptable. Testing also may be done at the Center for the Prevention and Control of AIDS (7 Talgarskaya Street, Almaty). Extrait from e.gov.kz While entering Kazakhstan each foreign national aged 16 or over shall be given a Migration Card. Migration Card form shall be issued at the Kazakhstan national border crossing points by the frontier guards of the Kazakhstan National Security Committee and by customs officers (Crossing Point Officers) where there are no border control points. For foreign nationals travelling by air and train migration card forms shall be given by members of train and plain crews beforehand for preliminary filling. Migration cards are issued and filled only by non-citizens of Kazakhstan (including citizens of CIS), traveling to the Republic of Kazakhstan, i.e. the destination place indicated in the ticket is located in the territory of the RK. Foreign nationals transiting around Kazakhstan with tickets where the final destination being a settlement outside Kazakhstan shall not be given Migration Cards. The card shall be filled in legibly by ball-point pen. Name and surname shall be written in the way they have been written in the passport using the alphabet used while filling it in (Roman or Cyrillic). The Arabic or other alphabet shall not be used. Surname of a hosting individual or name of a hosting corporation shall be indicated in the Host column, as well as the area he/she resides (place of corporate registration). Number of children under 16, arriving with the foreign national, shall be indicated in the Accompanied by Children column, for instance, ‘two’. Migration card may be filled in Kazakh, Russian or English at the foreign national’s discretion. Migration cards shall be shown to border (customs) officers together with passport. A migration card shall be kept by a foreign national until departure from Kazakhstan and shall be shown as required by the interior officers, border or customs officers. Marking of registration of the interior authorities shall be done by migration police officers. To make it convenient for passengers travelling by rail, the rules and a sample migration card must be displayed in railway cars. If problems when filling the card you may apply to the migration officer for explanation. passengers of trains transiting across Kazakhstan, drivers of vehicles, involved in international motor traffic. Foreign nationals having exit visas depart Kazakhstan by the same valid documents if visa free policy is not applied to them. 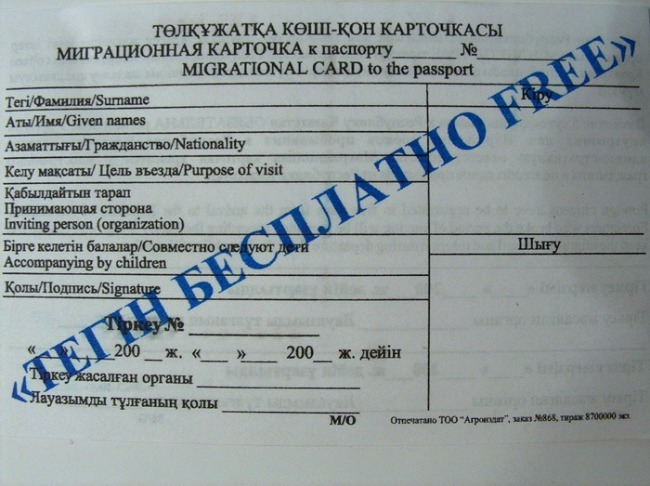 Migration Cards must be returned when exiting from Kazakhstan.